I'm currently living in a home that has most likely been painted at least every 2 years since the 50s. The paint-history totally shows on all the door knobs, playing out in accidental swipe marks and drips. If you were to peek behind the knobs you could literally see the years play out in paint layers, with many of those layers ending up on the hardware itself. They say it's the details that create the big picture, and after seeing how sleeker my hardware looks after stripping it, I have to agree. While you might not feel like painted-over hinges and handles are worth the effort of restoring, it's amazing how fresh and new your home will feel. 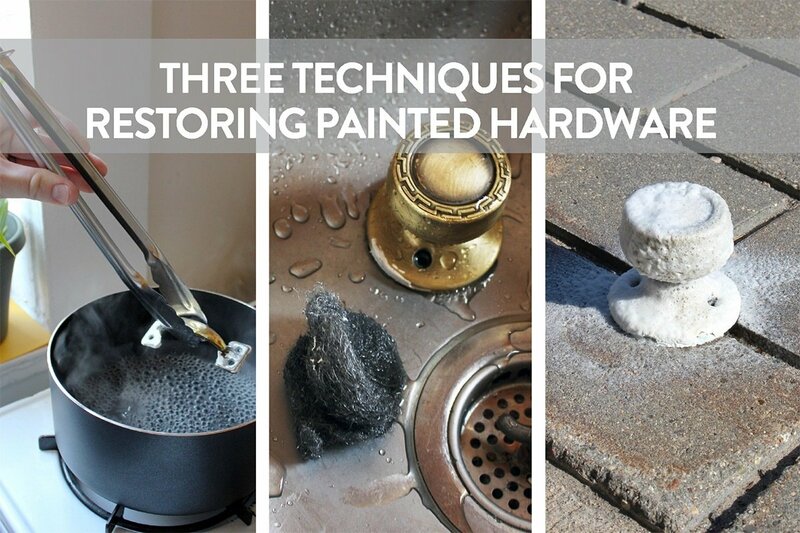 I tried out three different methods of removing old paint from hardware, and am here to tell you what worked. I'll walk you through what I did, what I learned, and what the pros and cons are of each method. I don't know about you, but I can't afford expensive furniture. I've grown accustomed to cheaper options like IKEA and Target, where I've found pieces that I absolutely love with one problem - the hardware is very plain. After my latest furniture purchase of a new media unit with two cabinet doors, I decided to upgrade the hardware myself and make DIY faceted handles out of clay. These leather strap cabinet pulls are a gorgeous--not to mention highly clever--DIY alternative to run-of-the-mill, big box hardware. All you need are a few simple materials! I'm not gonna lie: I have a lot of tools. If you walk into my basement, you'll see a fully-equipped studio/shop that allows me to come up with original how-tos and teach folks to make unique things for their homes. But, scads of power tools, craft supplies, or fancy software are a luxury, not a necessity. If I could only have five tools in my arsenal, I wouldn't choose a single power tool. Okay, well, maybe my table saw, but only because it's so versatile, and really fun to use. But there are inexpensive hand tools that work just as well. With that in mind, here's Curbly's top five DIY best buys: five things we think every passionate homeowner should have. Not an essential home maintenance kit, but five things that'll help you create your own original pieces of furniture, home decor, and art. All under $20 USD. The folks at Ace Hardware are going to help you out with a few DIY project this week: they're letting us give away a $100 gift card! Read on to find out how to enter to win (it's quick and free!). 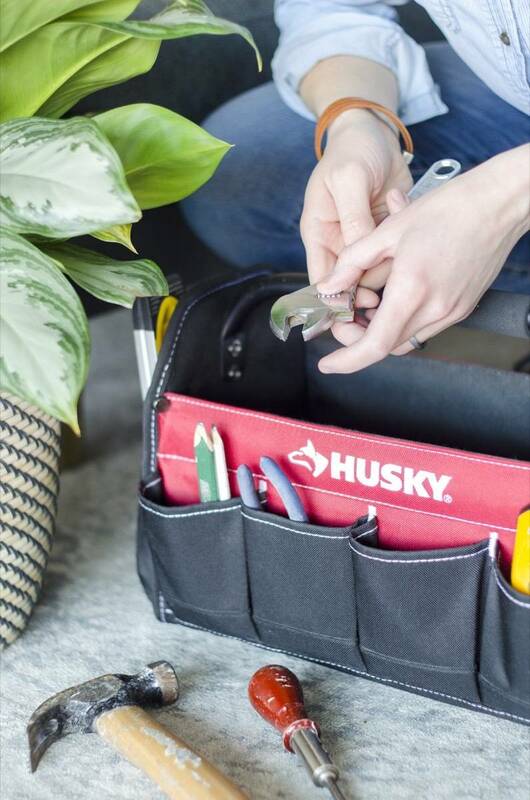 But before you do that, make sure to check out Chris's post on the top five essential DIY tools under $20; what are your essential DIY tools? It's equal parts rustic, modern, and cottage chic - but there's one thing this sliding barn door is not: boring. Our master bathroom vanity is ugly, awkward and has terrible hardware. However, like most home improvements, a bathroom remodel would open up an expensive can of worms. But then I saw this little inexpensive transformation which blew me away and has me thinking.